The UFC women’s flyweight division is about to get violent. Reigning KSW 125-pound champion, “The Violence Queen” Ariane Lipski is on her way to the big show. The 24-year old Lipski (11-3) has established herself as one of the very best flyweights in the world. Becoming a star during her time in Europe as the KSW champion, she currently rides a thrilling winning streak of nine straight (five KO/TKOs, two submissions). 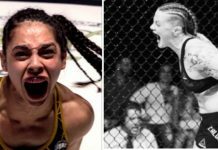 Brazil’s Lipski is all action all the time and because of that, during negotiations for a new contract, KSW was hoping to keep her according to MMA.pl. However, Lipski has decided to test herself elsewhere as her division is getting more and more attention stateside and she wasn’t pleased with the lack of opponents she started to receive. Or…not receive. Well, when you just keep on winning, that can happen. Lipski made a statement on the separation earlier today. As many already know, our contract with KSW has not been renewed. I understand that it is sad news for some fans of Poland, but I want you to know that I will always represent Brazil and Poland, it is in my blood and it is my second home. I want to start by thanking KSW for introducing me to the world, for giving me the opportunity to know my roots and a beautiful country like Poland !!! Thank you @martinlewandowski and @kawul_ksw I love @ksw_mma and I am very happy to have worked with all of this beautiful organization, they were great experiences, thank you !!!! I hope to return to fight for KSW one day, and I promise to return to Poland as soon as possible !!! Thanks to the fans who were happy for me because they understand that it is a new phase in my career, your support is very important for me, I will always be with you. All news related to hirings or fights, are mere speculations have not finalized any negotiations. Since the announcement, it was confirmed that Veronica Macedo was injured out of her scheduled bout with Maryna Moroz (8-3) for UFC Buenos Aires on November 17. Combate has reported that this is where Lipski will make her UFC debut as she replaces Macedo. For Moroz, she will be coming up from the strawweight division as this will be her first fight at flyweight since 2014. Since her big upset UFC debut over Joanne Calderwood, Moroz hasn’t been able to replicate that same kind of magic that we saw in that fight. Maybe a change in weight class will be just what the doctor ordered as her back is against the wall after losing two in a row. In the end, all eyes will be on Lipski and rightfully so. It’s just up to Moroz to see if she can play spoiler once again.